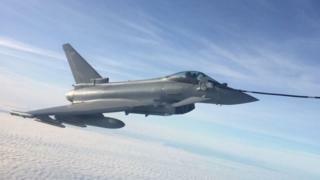 Two Typhoon jets armed with air-to-air missiles intercepted Theresa May's plane on its return to the UK from Cyprus as part of a training exercise. Theresa May watched pilots carry out the manoeuvre - a rehearsal for a suspected hijacking scenario - from the cockpit of the RAF Voyager. The jets, scrambled from RAF Coningsby in Lincolnshire, also hooked up to the PM's plane for air-to-air refuelling. Mrs May was returning from a two-day trip to Poland and Cyprus. The fighter jets pulled up alongside the converted Voyager at 17,000 feet, and tipped their wings as part of the exercise. Watch: What is it like to fly the RAF Typhoon jet? Pilots from 3 Squadron and 11 Squadron performed the manoeuvre. The jets each took on four tonnes of fuel during the exercise, at 600kg-a-minute. The Typhoons are the sort of jets that would be used to intercept foreign planes illegally entering British airspace and the exercise demonstrated how the RAF's Quick Reaction Alert would work. Mrs May was said to have spent the rest of the journey working on papers from her ministerial Red Box and relaxing with a sudoku number puzzle. She said: "Witnessing the unique skill of the RAF at first hand is an absolute privilege and demonstrates that the British Armed Forces are the finest in the world. "The work they do is admirable and impressive and I want to take this opportunity to thank them for everything they do to keep us safe."